Just a day after the brutal slaughter of Las Vegas concert-goers, we were told by the media that 64-year-old Stephen Paddock, who was immediately identified as the killer, left no digital footprints and was radicalized by ISIS, this last bit reported on by the Amaq news agency, which claimed he converted to Islam six months ago. Today, law enforcement officials told NBC News that they are combing through Paddock’s web browser and his browsing history showed he researched other attack locations, such as Boston and Chicago. So if Paddock wasn’t on social media, then who and how was he proselytized? What local Muslim group or individual convinced a so-called millionaire gambler, real estate investor, and pilot that in order to save his own soul he needed to become a Muslim. The entire report is completely implausible, and if the media is to be believed, he spent most of his time in casinos. It is also hard to believe how a new convert of just six months could have planned a massacre of this proportion in so short a time, again leaving no digital footprints. Even more incredulous is today’s latest headline linking explosives found in his car to the same type used in the New York city subway bombing in September 2016. If Paddock is linked to this bombing, then he “converted” to Islam a lot sooner than six months ago. And why isn’t girlfriend Marylou Danley talking about his new found Muslim faith? Surely a long-time boyfriend who converts to the Muslim faith would be a huge red flag in a relationship? Rather, the media reported her as saying he wired her $1 million in the Philippines because, as she purportedly said, she thought he was going to break up with her. Married men generally have to be ordered through the courts to give any type financial assets to a woman he wants to be rid of. 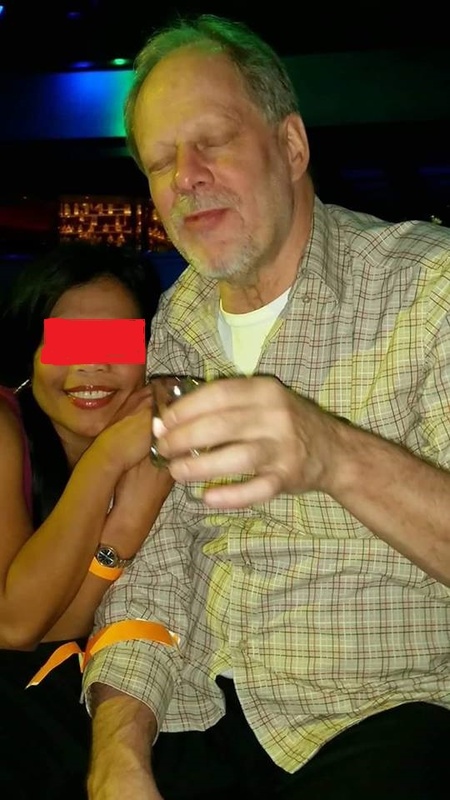 Why would Paddock pay Danley, who he was not married to, to break up with him? Danley also made two later statements through her lawyer that completely contradicts this bizarre breakup theory first reported on: “I am devastated by the deaths and injuries that have occurred. I knew Stephen Paddock as a kind, caring, quiet man. I loved him and hoped to have a quiet future with him…. “ Sounds like she was planning a future with Paddock, not receiving a payoff for a breakup. Danley is now saying that Paddock sent her the money to purchase a home for her family in the Philippines. And why would Danley, a reported former casino host, hire attorney Matt Lombard? Lombard is a criminal defense attorney who worked on the defense for Terry Nichols, an accomplice in the 1994 Oklahoma City bombing. Very curious, indeed. Am I to believe that a man who sat in casinos all day long and who, as depicted in the same eyes-closed-shut photo carried by every news outlet, who appears pale and unfit, managed to haul all of these guns into a hotel suite before shooting down 58 people and wounding 492. The FBI is either uninformed through compartmentalization or outright lying. The girlfriend is now reportedly to have said that Paddock was in mental anguish, saying she remembers him lying in bed moaning, this according to two former FBI officials who were briefed on the matter. I see two immediate red flags with this report. First, why would former FBI officials be briefed on the matter and why would they be leaking this information to NBC News? Second, the FBI is reporting that Paddock may have had some mental issues, but deny that his mental state was degraded enough to have triggered a complete mental breakdown. After all, I am sure many 64-year-old people moan in their sleep. The body certainly isn’t what it used to be. I won’t even touch the issues of the evidence pointing to multiple shooters and the length of time it took SWAT to enter the room. Anyone following this completely crazy script would be well aware of the inconsistencies coming from the so-called investigation and media misinformation. What I can say is that this whole story stinks like day old fish left out in the sun. I don’t believe Danley is culpable in any way to the Las Vegas shootings any more than I believe Paddock is the shooter. I believe Danley is petrified and, as for Paddock, dead men tell no tales. I believe that Paddock was targeted by the CIA to be their fall guy and that he was brutally murdered and placed in the room before the massacre began or he was murdered prior to the massacre in the room. I would have to suspend reality to believe that the CIA, who created ISIS, isn’t behind the attack or behind the announcement behind the fake news of the Islamist State’s claims that Paddock was a recent convert. There is simply no logical explanation for why someone such as Paddock would be involved in the massacre, particularly when family members and those closest to him say he had no religious or political affiliations. I also find it implausible that Paddock was claiming to have planned his escape and investigators say they found material used to make exploding targets in containers in Paddock’s car, along with about 1,600 rounds of ammunition. The whole thing sounds like a pulp fiction movie, just as does the Antifa literature they say filled the hotel room. I could go on, but you get the idea. It is difficult to believe any of the information being leaked is credible. Frankly, we will never know what actually happened unless someone who has knowledge of the actual facts breaks ranks and exposes the truth. I believe that the law enforcement officials and members of the actual SWAT are working hard to uncover the truth, it’s the CIA and those planted deep in government that I don’t trust. If my instincts are right, Paddock was not the killer. Rather, he was murdered by our own government so they could murder and maim conservatives in an unholy jihad against the right and, once again, call for a gun grab. If they can kill our own Ambassador Stevens using ISIS as their front, they can certainly take out unsuspecting country music fans. The lust the left has for violence is insatiable and a sacred religion to them, thus the continued drum beat to take away the right of Americans to bear arms. Rather than the red-pilled chasing down fake news, they should be vigilantly preparing for the next attack. As sure as the sun will rise again tomorrow, the civil war has already begun. It’s time for the right to pick up the sacred mantra of the left and not let a good crisis go to waste. After all, we know who is funding Antifa and Isis and they have already declared their violent plans. It’s time to get organized and ready. Reign well.